STATdx is an online point-of-care clinical decision support system for the practicing radiologist. You can see the full version of this image in the article. The explosion of the medical knowledge base is heralding an era of infinite clues. With biomedical literature soon expected to double every 73 days, radiologists, pathologists and other healthcare professionals are being bombarded with clues that make it technically impossible to keep up. Furthermore, sourcing for the exact clues that are relevant to the exact patient and his or her exact medical condition is a time-consuming process that requires significant effort to gather, screen and evaluate all available evidence. In an environment where the saying,\ “time is of the essence” takes on a whole other meaning, reducing the time spent on this endeavor is not only critical to providing effective care but also saving lives. 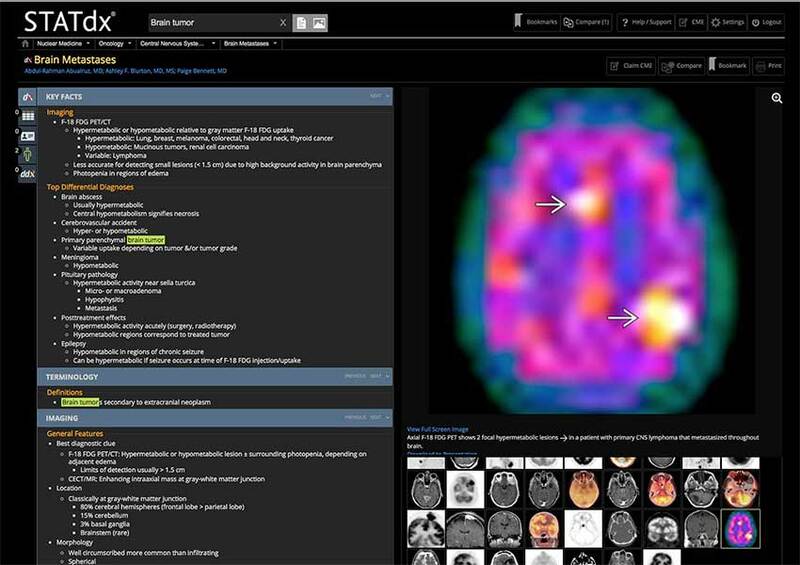 While information is readily accessible via generic search engines such as Google, these platforms are incapable of delivering the specific search results that radiologists and pathologists depend upon. As such, information that is important and applicable often does not surface, while irrelevant, unvetted and possibly erroneous information does. Thankfully, however, there are ways to play smart and win at Clue. Advancements in technology are positively impacting the way radiologists and pathologists practice. One key area is Clinical Decision Support Systems (CDSS), which has become an integral component of healthcare in recent times. The growing levels of innovation and adoption of specialty-specific knowledge-based decision support tools are making the “five rights” approach possible – pushing the right information to the right person in the right format through the right channel at the right time – ultimately enabling radiologists and pathologists to produce the right diagnosis and consequent care. Elsevier has combined both evidence-based clinical information and advanced search technology to provide healthcare professionals the fastest possible way of cutting through the clutter and getting to the clues that matter. Two of these solutions – STATdx designed for radiologists and ExpertPath designed for pathologists – were recognized recently for the quality and value delivered to customers, receiving Frost and Sullivan’s 2017 North America Technology Innovation Award. It was a wonderful honor and a strong affirmation to the dedication towards improving patient outcomes through evidence-based care. STATdx is an online point-of-care CDSS for the practicing radiologist. It features more than 4,300 diagnostic evaluations written by internationally recognized experts such as Dr. Osborn, 200,000 expert-selected, annotated and searchable images, 1,300 differential diagnosis modules, and a step-by-step guide to radiology procedures. 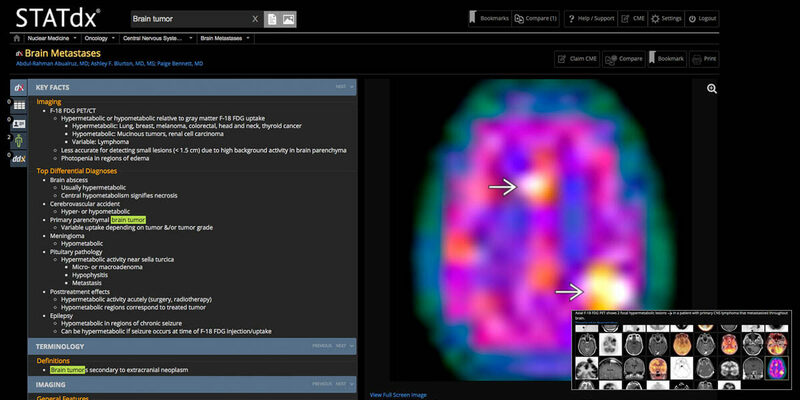 It is consistently maintained and updated, serving the most current and credible reference materials to radiologists. Since adopting STATdx in 2016, radiologists at Taichung Veterans General Hospital (VGHTC), a medical center and teaching hospital in central Taiwan, have reported saving up to 67 percent of time spent on each case’s diagnosis, cutting the time required for image referencing and diagnosis from 30 minutes to just 10. They have also seen a boost in diagnostic confidence, as underscored by resident radiologist Dr. Hsin-Yu Tsai, who said the comprehensiveness of the solution has allowed for greater certainty through the minimization of misinterpretations. Similarly, Elsevier designed ExpertPath to provide the same decision-making support for diagnostic pathology as STATdx does for radiology. In a recent customer poll conducted globally, Elsevier found that 90 percent of respondents – including fellows, residents and certified pathologists – would highly recommend ExpertPath to their peers. The key reasons cited across the board included “easy, quick and convenient access,” a “well-curated, regularly updated database” of vetted information and images, and time saved in the assessment process. Healthcare professionals need to readily embrace innovation. With access to knowledge-based decision support tools at the point of care, radiologists and pathologists are better empowered to deliver faster and more precise diagnoses, ultimately improving clinical outcomes through evidence-based care. At Elsevier, we truly want a win-win situation for all parties in the game of Clue. We are focused on helping healthcare professionals make the right decisions at the right time so patients receive the highest quality care. Find out more on Elsevier’s winning solutions at for the Frost and Sullivan 2017 North America Technology Innovation Award.